Sir Octopus iPhone Game Review: Don't Be a Sucker, Grab It! Sir Octopus iPhone Game Review: Don’t Be a Sucker, Grab It! Sir Octopus is an iPhone game developed by Sergii Orlov/Wooden Sword Games. 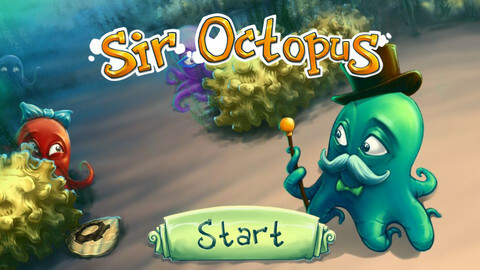 In this engaging puzzle game, you must help the dapper Sir Octopus retrieve his wayward children. The story of Sir Octopus unfolds through comic book-style panels that depict Sir Octopus and his family in their lavish, Victorian-style home. 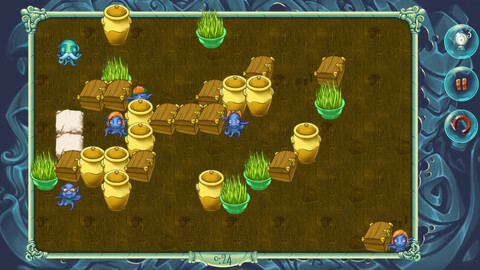 There are three level packs you’ll need to master in order to help Sir Octopus gather up his kids, who are hiding. 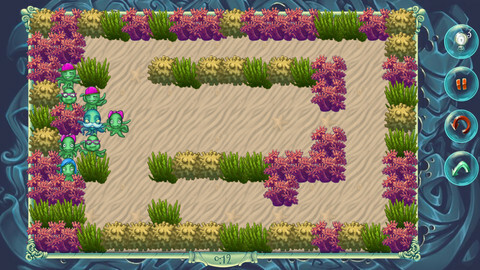 The controls are quite simple: swipe with your pointer finger to move Sir Octopus around the level. Once you “bump” into an octo-kid they are attached to you permanently. Grab all the kids to finish the level. Without question, the graphics for Sir Octopus are stunning. The combination of 2D puzzle level design and brightly colored characters gives the game an almost SNES look in some instances. I wouldn’t describe the graphics as “retro,” but the game does manage to bring the warm fuzzies of nostalgia to players who love old console games and early handheld games. The graphics manage to be both attractive and whimsical at the same time. Perfectly complementing these graphics is the jazzy, classy soundtrack. I almost never play iPhone games with the sound up, partially because I don’t want to be disruptive but mostly because most iPhone game music is awful. The Sir Octopus themes, however, are toe-tappingly delightful! Some of the early levels do seem a bit elementary, but the game ratchets up the intensity fairly quickly. One thing that’s nice is the selection of undo buttons: you can re-start the level if you screw up, or just undo your last few sets of moves to try a new strategy. Featuring 69 levels packed with 2D puzzles, Sir Octopus is a wonderful game. Perfect for both kids and adult players, the challenging level design and cute graphics combine to make a really stunning game for your iPad or iPhone. Sir Octopusis compatible with iPhone, iPod touch, and iPad. Requires iOS 4.3 or later. This app is optimized for iPhone 5.